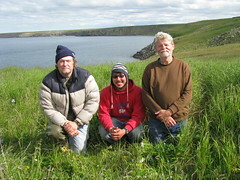 Here is the crew that survived 3 weeks on the west end of Nunivak Island. They were document shorebird colonies along the island. They saw Gyrfalcons, Parakeet Auklets, Murres, Horned Puffins, Tufted Puffins, Rudy Turnstones, Pigeon Guillemots. Noteworthy events were a range extension for the Whiskered Auklet, and seeing multiple pairs of the Siberian Race of the Rosy Finch. Counts on the survey estimated over 250,000 birds, a majority being common murres, and black legged kittiwakes.